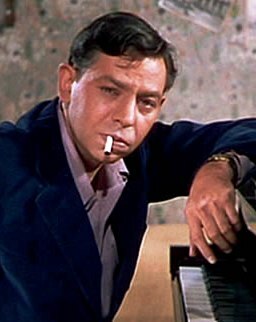 I first heard of Oscar Levant (December 27, 1906 – August 14, 1972) when I was probably 12 or 13 and becoming aware of music as a growing obsession. I had recently discovered George Gershwin, thanks to my sister who had a LP of piano rolls of Gershwin playing Rhapsody in Blue. I would hang out outside the door to her bedroom and listen to the music and think it was the greatest thing in the whole world. It wasn’t long before I found out that there was this crazy pianist named Oscar Levant who had made something of a specialty of Gershwin. Levant was not only known as a pianist but because of frequent appearances on game shows where he demonstrated his quick wit, he became something of a celebrity in the ’50s and ’60s. But Levant was a serious musician. Around 1932, Levant began composing seriously. He studied under Arnold Schoenberg and impressed him sufficiently to be offered an assistantship (which he turned down, considering himself unqualified). To remember Levant, who passed away on this date in 1972, here he is playing Gershwin’s Three Preludes.